Sometimes issues occur in school that cannot be solved with a parent-teacher conference or time with a tutor. These issues can erode a child’s confidence and future with each passing day and result in the child not making educational progress or otherwise struggling in the school environment. Parents feel the pain too; no mother or father envisions distress as part of their child’s life. George Riter, managing partner at Timoney Knox LLP of Fort Washington, says parents are often unsure of the next steps when their child is having serious struggles in school. Is the school district doing what is needed to properly support the child? Should the child be in a different school setting? Who do the parents even call about these concerns? The answers to these questions about the legal aspects of a child’s education and the rights of children in school can be determined with the support and guidance of the Education Law Group at Timoney Knox. This law firm, which was founded in 1921, prides itself on being the legal resource for the community—and that includes helping parents solve any issue involving a child’s education. An increasing number of families are making that call to Timoney Knox. “We are meeting with or on the phone with parents every day to help them work through the issues involving their child’s education and to effectively advocate for their child,” says Scott Wolpert, who heads the firm’s Education Law Group. Wolpert spent two decades representing public school districts. He understands why school districts take certain legal positions and can offer families a realistic perspective about how legal and educational decisions are made; he has the knowledge and experience to know what needs to be done and how to do it. The Education Law Group at Timoney Knox believes in the mission of providing exemplary legal services to parents and children in securing appropriate educational programs for children with disabilities and ensuring the protection of the rights of all students in schools. In pursuit of this mission, Wolpert and his colleagues provide effective, responsive and aggressive advocacy that addresses the needs and goals of the families they represent. Wolpert is a frequent speaker throughout Pennsylvania on issues involving special education and the protection of the rights of all students in schools. He has attended more than one hundred IEP (Individualized Education Programs) team meetings and handled many due process cases and disagreements between families and schools. Christine Gordon, an attorney in the Education Law Group, has spent more than five years in education law and special education work and previously worked for a child psychologist. Gordon outlines some of the obstacles students unfortunately face: bullying, hazing, improper student discipline and the unwillingness or inability for a school district to provide an appropriate education to a student. Wolpert and Gordon deal with the last category extensively in helping students with disabilities and ensuring that school districts comply with the Individuals With Disabilities Education Act and Section 504 of the Rehabilitation Act. 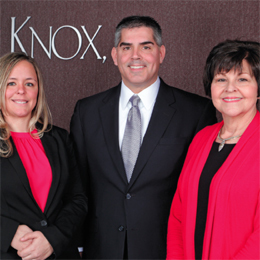 Timoney Knox helps parents at every stage of their child’s education. The lawyers and staff are accessible to their parent-clients, responsive to their questions and concerns and available to explain the educational and legal processes. “We help parents navigate the educational and legal issues, including documents, that make up their child’s educational program. We work with parents to prepare for and participate in IEP meetings. We represent parents and children in meetings and communications to resolve disputes with schools. We represent parents in due process hearings and appeals when other options have not resulted in a reasonable resolution for the parents and child,” says Gordon. Timoney Knox also maintains close relationships with respected professionals in the field of child development, counseling, psychological services, autism, learning disabilities and mental health. The firm helps parents in the identification process by suggesting appropriate evaluators; explaining the meaning and implication of reports; reviewing the documentation related to the child; and suggesting that the parents consider appropriate providers, schools and programs. “Really, it comes down to ensuring that the child receives an appropriate education,” Wolpert says. The Education Law Group also relies on a highly experienced former educator, Patricia Mueller, an educational paralegal. Previously, she worked with children with disabilities and their families as a supervisor of special education programs in two high-achieving local school districts. Mueller is also an American Speech Hearing Association Certified Speech and Language Pathologist. She has more than 25 years of experience as a special educator and supervisor. Mueller has been involved in hundreds of meetings for IEPs, which public schools must develop for each child who needs special education, and similar educational evaluations and services—in short, “the critical elements of education that support a student,” Wolpert says. Timoney Knox will do what is needed to secure that ever-important right, whether through advising parents, advocacy with a school or through a due process hearing when necessary. “The firm’s experience in education-related conflicts,” Wolpert says, “makes it an invaluable ally for parents.” So does the fact that Wolpert, Gordon and Mueller, who are parents themselves, have the human touch to complement the legal expertise. Wolpert says that personal approach is crucial in this emotionally charged area of law. “When a parent calls us, they have probably hit a level of frustration in their ongoing relationship with their school district,” Gordon adds. “It is a difficult time for them. Being empathetic and carefully listening to our clients’ concerns is essential,” she says, “along with having the objectivity to find the best practical solution for the child.” Parents must consider that their child could be spending another 10 years (or more) in their school district. What does the future hold for the Education Law Group at Timoney Knox? They will continue to work to support parents and children in school, every day.